At Time to Change we generally get around 1000 visitors to the site a day. On peak days, like World Mental Health Day, this might double, but there’s enough flex in our server capacity to manage that without issue. Once a year though, the first Thursday in February, we run Time to Talk Day – a massive single day campaign to get the whole country talking a mental health. We’re lucky, it’s very successful, bigger and better every year we do it – just last week I was in a meeting with someone from an agency wanting us to pay to trend that day, we were all quick to point out we organically trend all day anyway, without paying a penny. Very, very lucky. The downside though, if we can call it that, is that we’ve now reached a point where our site’s infrastructure is not equipped to deal with the spike in traffic, which last year reached 32,000 visitors and tripled the time it took pages to load for supporters wanting to take part in the day. It never went down, which was a relief, but it was painfully slow, despite our most ambitious estimates and load tests in the preceding months. So it’s my job this year to make sure we’re ready, not ready for a sensible growth on last year, but really ready for the kind of numbers we feel arrogant even talking about – just in case. In previous jobs I’ve just called the hosting company to increase the server capacity, maybe even kick a few smaller charities off to give us maximum breathing room. But the issue at Time to Change is we’re already on the biggest physical server, at its highest capacity, so the standard option isn’t an option for us. Ruling in and out the various alternatives has been pretty stressful as they all carry risks and, as ever, it’s a ridiculous time of year with millions of other urgent things happening at the same time. I’m going for 5 and 6, we’ve got just over a month to get it right and in the meantime I’m site auditing our 10,000 pages to make sure we’re only working as hard as we need to. In part 2 I’ll let you know how it went! PS – another way to find out is to take part in the day, 4 Feb 2016, let’s get the nation talking about mental health. I’ve been lucky enough to inherit my job at a time when digital was expanding for Time to Change. Previously development work could be easily contained on an ad hoc basis, with emails back and forth to manage each project and few enough demands on a small team to make this possible. Since joining, that’s changed and I needed a system to ensure workload and delivery schedules could be predictable, to satisfy the demands of internal teams as well as ensuring we could confidently meet our own commitments for development and growth. To achieve this I set up a sprint cycle system, managed through Podio, the online project management tool. During each month I plan for the following sprint, working out priorities for development within our team as well as communicating more widely with the rest of the programme about ideas they might have to make their jobs easier or better respond to user experience issues they’ve identified. I then wireframe all the ideas to check everyone’s on the same page and collate all this into an amount I think can reasonably and logically be achieved in a given month, then email the developer with a headline description of the forthcoming work. This is an important step because it gives him the chance to identify any areas that might be more difficult to achieve or require greater resources that we have available. Once I have the go-ahead, I begin writing a detailed brief, dividing the work into sections (usually by team or area of the site) and within that splitting each component into individual tasks. I then email for a formal quote. Once the quote’s received and approved, it’s usually now the end of the month, I set up an e.g. “October sprint cycle” project on Podio for the upcoming month and upload the brief. Once the first of the month ticks round, the developer starts work and usually completes the first daft on staging within a couple of weeks, having checked any small details with me via the project comment stream. Then I’m ready to begin first round user acceptance testing. Testing involves gathering all internal stakeholders and/or recruiting external user testers for bigger projects. It follows a similar process to briefing, I take the original brief and allocate each task a place in a UAT table in Word. Table headings are usually Job (component of work) Status (further work / ready to deploy) and Notes (explanation of edits, etc) As I check each component and run through it with the team of testers, feedback and status confirmation is entered into the table and presented back to the developer. Edits are then made and the same process repeated until the status of every job is “ready to deploy.” At this point it’s a couple of days from the end of the month. The developer deploys to live, giving us enough time to work out any live environment bugs. Internal stakeholders are gathered again for signoff, they can make minor tweaks or alert me to any strange browser or mobile behaviour I can’t replicate, but all “actually can we also have this” requests are labeled as new requirements and will go into the next month’s sprint. Final tweaks are made then that’s it, sprint delivered, everyone’s happy and the whole thing begins again the following month. I find this by far the easiest and most efficient way to manage development. It does lead to stressful spikes in workload, but as long as you’ve planned for those, built in the time and prepped everyone in advance, you’ll be fine. I hope this is useful if you’re thinking about moving to the sprint model! I’m generally alright at predicting how well posts will do and I was pretty sure this one would be post of the month, but post of the whole seven year programme was definitely unexpected! This was it, for Depression Awareness Week 2015. It got 19,505 likes, 100,976 shares, 550 comments and a reach of 8.2 million. 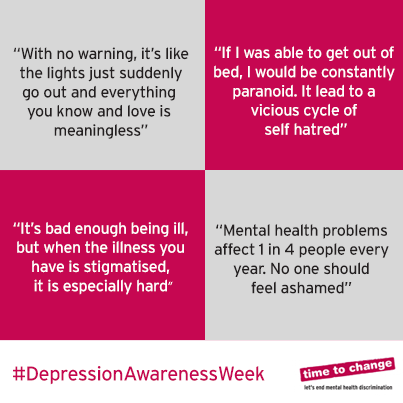 “Today is the start of Depression Awareness Week 2015. Whatever depression feels like for each of us who experience it, no one should feel ashamed of what they’re going through. Because it was so unusually successful, a few people asked why I thought it did so well. Timing – I was a little bit cheeky here as it was Depression Alliance‘s day, I kept an eye on their page on my commute thinking if they post before 9am then the rest of the day is fair game. As it was they still hadn’t posted by 9.50, so I decided to go for it. Being the bandwagon people are jumping onto is a huge advantage, it would have been totally fair if that was Depression Alliance’s bandwagon, but I wasn’t going to wait all day for them to get there. Personal stories – I tried to make the copy on this as relatable as possible, using some of my own experience but written in a way I knew would ‘work’ as well as experiences from people who had written blogs for us in the past. This makes the most of social capital, people share it because it’s how they feel too. They’re my 10, you might have others, or have had similar success yourself, I’d be interested to hear! I had to do something I really disagree with today and it’s something I truly believe puts people in danger. I posted an article containing triggering images about anxiety, with a warning for people not to look if they were likely to be triggered by them. Shortly after I posted it, we had a comment from a supporter saying “Well don’t bloody post it then if it’s going to trigger people.” This is the essence of everything I think is wrong with trigger warnings – the content isn’t safe, we know it isn’t, yet we choose to post the article anyway because somebody came up with a flimsy get out of jail free card which we tell ourselves makes it alright. The argument I lost in the office today was whether or not a warning gives people a choice about whether to read an article or not. I say it doesn’t, certainly not in mental health, all it does is give people a big red button and a line of text telling them not to push it. Speaking from personal experience, anxiety and control issues are often about boundaries. Sometimes you want to push yourself, test yourself and see whether it will hurt. A lot of people also want to know they’re not alone in their experiences – they’re following a Facebook page to be part of a community, so posting something and telling a section of your supporters to stay away from it always feels to me like poor community management. To my mind, however much we stand to achieve from sharing content, I never want to be in the position of baiting supporters for PR gain. It feels like an abuse of our position and of the trust people place in us to set an example and do the right thing. In my previous job I was a community moderator and there trigger warnings were constantly misused. People casually posted graphic images of self harm and thought that a lazy ‘tw’ at the beginning of the post absolved them of any responsibility for the harm it might cause another user of the site. We always took those posts down because if something isn’t safe then to us that was the end of the story. I don’t think anyone really wants to be in the latter camp, so let’s stick to the safe inspiring stuff that doesn’t carry that risk. Every now and then, wherever I work, I have to brace myself for “could you advertise these jobs?” or “could you share this blog from the CEO?” These are both pretty routine things and shouldn’t involve setting aside half a day to argue with people on social media, but invariably they do. Charity spending, lobbying, expanding, any action that implies progression in a cause which I hope we all believe is right and necessary consistently provokes a dispiritingly naive backlash from a vocal few. This issue angers me not because I resent the irony of spending valuable charity time engaging in futile conversation, but because I believe in the bigger picture – I want us to beat cancer, to end mental health discrimination, cruelty to children and people drinking unsafe water. I don’t believe money spent or high level conversations had in order to achieve these goals are unnecessary or wasted, I believe they are in fact the only way we’ll get to where we need to be within our western capitalist structure. This framework is something we cannot change and I find it unbearably frustrating when successful charities are damningly compared to a group of five people working for free in a tiny room above a shop, they are not more worthy of your time or more committed to an issue you care about because they don’t spend money on achieving it. Instead, they are unknown, they can’t make any difference in the ways that count because nobody knows they’re there, they don’t have any political pull, they can’t afford to hire the best people for the job, they can’t get anybody to donate to them, fundraise for them, strategise for them or spread their message of change. If we need any more convincing on the roadmap to making a difference, we need only to turn to the person next to us and ask them to name a charity. Did the person next to you say Macmillan, Cancer Research UK, Greenpeace, Oxfam, UNICEF or Amnesty International? How many named Green Light, a tiny Cornish charity working with autistic children whose website is impossible to find because they’ve decided not to invest in a good enough web manger who knows how to address that? Success costs money and it’s not money that’s wasted, the successful charities are the only ones who are changing the world. Everybody who works in the sector could earn more outside of it, but we’re here because we want the world to be a better place. I don’t feel my salary is profligate, I’m a manager at a big UK charity and I share a one bedroom flat with my partner and my cat. We’d like to own a house one day and maybe upgrade the cat to a baby, these are ordinary things but they feel very out of reach for us. And yet I have no interest in offering my skills to the private sector because I believe that what I’m doing and what I’m part of is making a difference to people’s lives. As long as that remains our motivation to keep growing and reaching then that’s exactly what we should do. Today the Samaritans launched a Twitter app designed, essentially, to help stop people in mental health crisis from slipping through the digital net. As the charity relies almost entirely on volunteers, and as suicide remains one of the UK’s biggest killers, I can certainly see why they might commission a project which monitors people’s tweets and gives them thousands of extra eyes and ears across the platform. Samaritans Radar isn’t a sentiment analysis app, it uses keywords to detect when someone is really struggling and might be at risk of taking their own life. Tweets containing those keywords are then sent as an alert to another user who has requested to ‘monitor’ that person’s account. So why are people so angry? Building an app which allows users to set up alerts on each other’s profiles is all a bit Orwellian and the majority of concerns raised have centred around privacy. The mental health community on Twitter is a strong one and many use it as a way of communicating and supporting each other almost privately using the @mentions feature. The idea that their tweets might be curated and reported on by a third party has caused a huge amount of anxiety in the few hours since its launch. An added and important concern is that it’s the Samaritans causing this anxiety, they are such a trusted player in the mental health world and for many they’re a lifeline in a crisis, people feel badly let down, perhaps more so than if an anonymous agency had developed the idea. Is there more to be worried about? Yes. Although privacy has emerged as the leading cause for concern today, I don’t think it’s the most important one. Currently, many of the people who are so worried about the app are using Twitter in a way that isn’t compatible with the how the platform is designed. Feeling like you’re having a private conversation is not the same as having one, Twitter is the very antithesis of private and everything outside of the DM feature is publicly accessible. Samaritans Radar does not change that. 1. People shouldn’t feel it’s their responsibility to save anyone. Working in mental health for four years, one of the most surprising things I’ve learned is that often people don’t feel they deserve support. This means that many who have struggled themselves want to give back as much as they feel they have taken and will sign up to the app to help anyone they can. When someone isn’t well themselves this isn’t helpful or healthy and makes people vulnerable to a decline in their own mental health. As a result, I think Samaritans Radar risks hurting as many people as it helps. 2. Users aren’t trained to support people in crisis. Although, broadly speaking, people within Twitter’s mental health community have personal experience and may well have a good idea what first response support might look like, it shouldn’t be their responsibility to be that person when someone’s in crisis. It puts an enormous onus on those people to know exactly how to respond, placing them in the vulnerable position of feeling responsible for saving someone’s life. Imagine if you were someone receiving alerts and you missed one because you were out to dinner with a friend or because you were in hospital receiving support for a decline in your own mental health. If you later logged onto Twitter to find that someone had taken their own life after sending a tweet that you’d been alerted to but hadn’t seen, you wouldn’t be responsible for their death but it’s not a huge stretch to imagine you might feel that way. 3. It matters whether someone makes the choice to tell the right people how they feel. This is perhaps the most important one for me because it gives power to the person in crisis. Our systems are crap, people wait forever for help, they’re not listened to, they’re not treated with dignity and respect, they’re turned away from A&E and they’re often not even counted as ill because what they live with is a mental rather than physical condition. The most important power that people have to change services and attitudes in mental health is their voice. I firmly believe that people shouldn’t be passive recipients of support, they should ask for it and be given it as a result, just like anybody with cancer or a heart defect. Samaritans Radar allows people to send a tweet into an anonymous void for technology to then pick up and make another user’s concern. Support shouldn’t be this way, people should know where to go to get it and have faith in a system they pay for that what they need is available, accessible and life changing. That’s what will save people, it’s not down to the merits of any app, it’s down to all of us to demand that the gap in the market that led to Samaritans Radar should not exist in the first place. Today a totally ridiculous coincidence happened, which I want to document somehow since it was fun to fix and will probably never happen again. When Mind launched their new website back in November 2012, we hired a keen team of digital volunteers to set about the tedious task of migrating content from one site to the other. Mind has a huge site, it was an endless and dispiriting task which we eventually decided to shelve, once the main content was over. What we left behind were several hundred old news stories and blogs, back as far as 2010. Since then we’ve had a fair amount of internal and external pressure to bring the rest across, none more demanding than Moz.com and its hard to ignore report of 404 errors resulting from dead inbound links. Google is our master and we’ve been willing anarchists causing SEO chaos all over the internet, it was time for action. A few weeks ago we decided to revisit the monster; exported the dead links in priority order and hired someone to migrate them. He’s been doing his job excellently for most of every day since he started, all’s been fine. Today, we had an announcement to make, a lot of work went into getting as far as launching the story and the last bit was the news article – no big deal. The media team added the news story, naming it “Mind Media Awards: shortlist announced”, which naturally inherited the standard url format taking into account its structural position and title. All fine. But back in the 1970s, a group of nerds at Ascii decided characters like colons in a url pathway would probably confuse or break things, so decided to omit them, which means servers don’t read that they were ever there, even if good CMSs like Umbraco are fine with the whole thing. We delete the migrated page, change the url of the news story and set up a 301 from the old to the new. Sorted. 15 minutes of team-awe ensue, while the rest of social media is none the wiser. Ace. Yesterday the world received the sad news that Robin Williams had taken his own life after struggling with addiction and depression for many years. Despite its prevalence, depression is still a much misunderstood illness and mental health organisations, along with their supporters, fight hard to ensure it has parity of esteem with physical health conditions. A lot has been achieved in recent years, through huge national campaigns such as Time to Change, as well as the work of leading mental health charities like Mind and Rethink Mental Illness. As ever, the media have a huge role to play in shaping public attitudes towards mental health, as well as a responsibility to report on suicide in a way that is neither glorifying nor triggering for the millions of people around the world who are struggling. 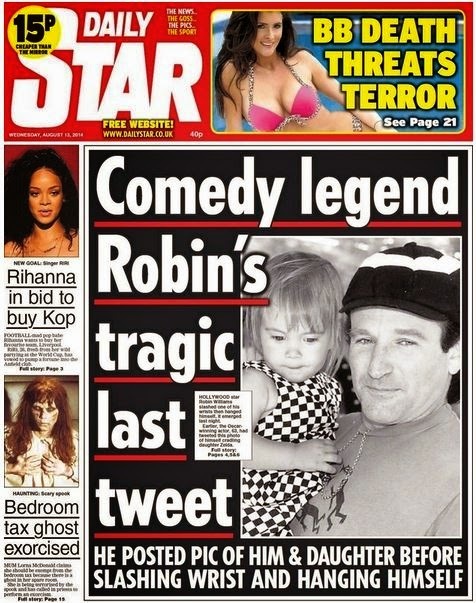 The first tweet I saw about Robin’s death was the beginning of what I knew would be a shameful few days of irresponsible messaging which can, ultimately, claim further lives. 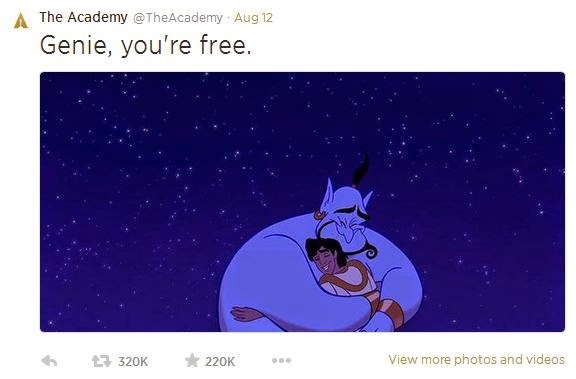 This post by The Academy is intended to be a well meaning tribute to the star’s work as the Genie from Aladdin. It has been retweeted over 3000,000 times so far, as undoubtedly kind hearted people from all over social media continue to share it in Robin’s memory. Despite its good intentions, what this post says is ‘when the pain gets too much, there is a way out.’ Wanting it all to stop is such a common feeling for people who are struggling with suicidal feelings and the media cannot continue to portray taking one’s own life as a peaceful solution to all-consuming depression. It isn’t peace, freedom or tranquility, it’s death – a permanent end to everything you are. 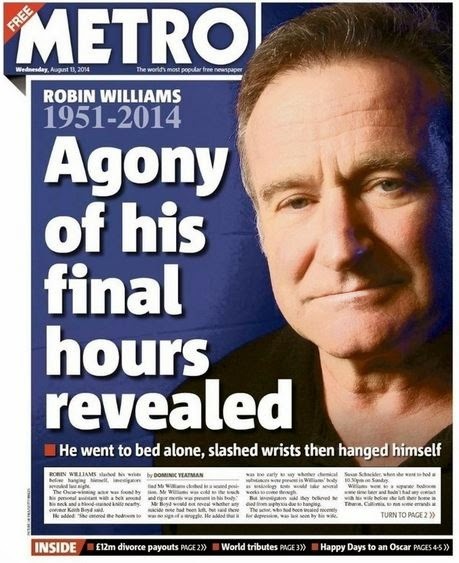 It’s dispiriting to have to talk about them but, as ever, the tabloids deliberately abused well established media guidelines on responsible reporting about suicide. If there’s one rule which everybody in the industry can’t help but know, it’s that you never ever mention methods. Doing so is akin to publishing an instruction manual to vulnerable people on the most effective way to end your life and leads to what researchers call ‘contagion’ or copycat deaths. This is not ok and the Samaritans guidelines on responsible reporting are freely available for anybody who’s unsure, please do read and share them when you can. Now that they’re out there, it’s not too late to make a complaint and help make sure these guidelines are followed. You might just save a life. I love my job, my paid, professional London job with its salary and other such luxuries that allow me to eat, pay my rent and keep the cat happy. But this doesn’t stop me keeping a casual eye on what else is out there, what kind of jobs are coming up in my area of work and what my opportunities might be in the future. What shocks me most about idly flipping through the charity job listings is how many which match my experience and interests are unpaid. These are full-time, long-term positions, often requiring some level of previous digital experience and invariably for the most wealthy and high profile third sector organisations. 1. To expect somebody to work for nothing over any extended period of time is exploitative. If they are to turn up regularly at a given place and time in order to complete tasks assigned to them then they are working, and if they are working then they should be paid, like everybody alongside them. 2. To advertise what is essentially a professional role and yet describe it as a voluntary internship undermines those of us who occupy those positions as part of our careers. When an organisation hands all or part of its digital communications over to somebody who isn’t valued enough to be paid, it sends a message that the role isn’t worth paying for and makes it difficult for smaller organisations to justify the creation of permanent posts themselves. 3. Increasing an organisation’s capacity through the ongoing recruitment of interns sets an impossible standard for how much one department can achieve. In the charity sector, organisations are in constant competition for the best campaigns, the biggest impact, the best management of social media, but if reaching these goals is artificially inflated by an unpaid workforce then it leaves others with no choice but to play by the same rules. What about the interns themselves? Arguments against paying interns are often centred around a lack of experience. This perpetuates the frustrating cycle which many young people in particular find themselves in – they need a job in order to gain experience, but are not able to find a job because they don’t have experience. Without addressing this problem, the existence of exploitative internships will continue as young people are forced to work for nothing in order to stand a chance of entering the paid job market. Another difficulty for many interns is that working for free quickly becomes an exclusive opportunity, only available to people whose family and friends are able to financially support them through it. This creates a socially unacceptable divide in which those with a wealthy family friend in Islington can live and eat for free, in central London, for the duration of their placement, whereas those without these connections can’t afford the time away from their paid student jobs in order to do what is too often necessary to get onto the career ladder. There are many reasons why people decide to volunteer within a third sector organisation and not all of these amount to the willing exploitation of desperate graduates. For some, taking a short-term voluntary role is a way of building confidence after a period of being out of work, perhaps due to illness, family commitments or a change in lifestyle. Volunteering can also be a way of trying out a new sector or transitioning from student to working life. These are all very different circumstances and what sets these placements apart from exploitative internships is their short-term and entirely flexible nature. Departments hiring volunteers are, of course, benefiting from the extra capacity that another set of hands brings to a communications team. With that, I think, comes a responsibility to provide as much flexibility, training, nurturing and investment as that person needs in order to get where they want to go. For this to work effectively, charities need to believe in the value of investing in somebody who can not only help them in the short-term, but also go on to contribute to the wider digital landscape once they’re on that more established path. Similarly, there needs to be a growing belief that one or two month voluntary placements are enough to qualify for a permanent, paid position at the nearest level. As a sector, it’s important we move away from demanding that people have six months to a year’s unpaid experience, because it’s both unfair and unrealistic. As we all know, everybody has to start somewhere, so I say let’s stop worrying about endless experience and give people that chance to get into digital. A month on and there’s no denying the success, in fundraising terms, of the no makeup selfies for cancer. They raised millions for Cancer Research UK, the first to spot their potential and channel participants to a text giving account. The campaign ticked all the boxes for creating sharable content – it was image based, easy to do, involved a small twist on everyday photo sharing and was perfectly set up for social media. What does not wearing makeup have to do with cancer? I love creating sharable content, it’s exciting, it’s satisfying, it has the potential to drive change and lead to something positive – it’s a great thing to be part of. That said, taking a sharable action and tenuously uniting it with a disease that affects everybody is lazy. It undermines the communications industry and places organisations which focus on high profile causes at an unfair advantage. It’s important to remember that the no makeup selfies were successful for two reasons, both the content and the cause. If we take away the cause then it’s a good idea, but it’s nothing new or groundbreaking. Cancer was the key ingredient which guaranteed viral, inspiring, money making success. Good digital media campaigns need to be meaningful, justifiable and contribute to wider learning about what works and what doesn’t. This campaign doesn’t help smaller organisations working hard to change the world, because all it teaches the sector is that people really, really care about cancer. If this is being linked to bravery, isn’t that appallingly insensitive? Amid the confusion was a rumbling implication that the no makeup selfies were in some way linked to bravery. Throughout the campaign I saw a number of references to a genuinely brave woman who had had a double mastectomy and who shared a photo of her body in order to raise awareness and tackle the fear and stigma associated with the operation. To suggest that everyday women taking makeup-less photos of themselves on the way to the gym was in any way an act of bravery, in this or in any other context, demonstrated a shameful lack of empathy for the millions of people struggling with the terrifying reality of having cancer. Isn’t this whole idea a bit cringingly anti-feminist? Finally, feminism took a real hit during this campaign and watching social media overflowing with women making demeaning and pro-patriarchal statements about themselves was intensely dispiriting. “It’s all for a good cause” is no reason to send social progress careering back to the turn of the twentieth century. Women gave their lives to free us from these condescending stereotypes, so let’s please not forget there are plenty of other ways to give money to charity. You could do it right now, here’s everything you need.